What are the real barriers to making transformational innovations today? How is innovation best managed? What should business, government and the third sector do to change things? The event was a great success, with original introductions and observations from the speakers and a lively and controversial debate that could have continued much longer. The speakers’ comments and the discussion are summarised below. The event seemed to be well received by the attendees, demonstrated by the attention to the discussion and quality of questions and points – as well as by the level of discussion in the post-event networking. We hope the event has raised the level of discussion of this subject, and were gratified that in the Prime Ministerial Debate that followed this event Nick Clegg noted the need to re-discover our passion for innovation, and David Cameron advocated the value of science. An audio recording of the talks and discussion will be posted shortly. Why innovation? Because of the need to raise productivity, increase the division of labour, living standards. The sheer dignity of science. Not just technology [organisation too]. See impact of electrification in Twentieth Century on industry, etc. Different approach in India and China: 2 Bn more people is 2 Bn more minds to be applied. See Yochai Benkler on new ways to use those minds and connect people as we have never done before. Uncertainty has become the organising principle of society. See David Cameron in the first leadership debate on not knowing what China will be doing in 10 years time. A new fatalism in which change isn’t about human beings assessing situations and taking action [check]. See the lack of scientific evidence on the ash cloud. Not an abstract point or luxurious cultural discussion: this has real consequence. Once you take this approach you abandon science. See commercial short-termism in research from Orange, H-P etc. You need knowledge to understand innovation. By contrast, see the New Labour manifesto on education as an export business. How will we train the next generation of scientists when we have this attitude? Low expectations of what next generation can [missed]. The Scientific Century report (began as Fruits of Curiosity, see also the US parallel, if more dramatic, report Rising Above the Gathering Storm) makes a case for ambition, thinking big, maintaining a long-term perspective. Note the response to the impact agenda and unrealistic expectations of politicians. Science features more in the manifestos. The Conservatives didn’t mention science in two previous manifestos. On the BIG POTATOES manifesto: I liked its global aspect: see the Atlas of Ideas project I wrote with Charles Leadbeater on how Asian innovation can help us all. I note the limitations of the linear model of innovation but we shouldn’t lump everything under a very amorphous definition of innovation. For the Royal Society’s 350th anniversary we are looking back. See the related book Discuss Seeing Further: The Story of Science and the Royal Society by Bill Bryson (ed.) Amazon.co.uk and the application of Alec Jeffreys’s work on DNA fingerprinting. [On ‘useless research’] Past Royal Society president: Research that is applied and that which is not yet applied. Didn’t like climate change element of Manifesto. [On Principle on precaution] Precaution is needed when dealing with some issues, eg: GMOs. Need precautionary and risk-based approaches. [On Principle on regulation] Regulation can stimulate innovation, eg: carbon taxes, building regulations. [Tells Charles Handy story on different reaction from frog put into boiling water vs put in cold water that is warmed to boiling] We are within warming water. This is as good a hot water as I have seen in a long time. That new MPs will not have a scientific background is a problem. Change can be upon us without us realising. What is innovation for? See cure rate for various cancers. Increasing population proffers possibilities but also problems, eg: obesity. This requires innovation. You can all think of a dozen other examples. People can’t understand that we are a car company! Avoid faux science and bad method. Marry research to fundamentals to allow innovation to happen. Concerned about the use of language: Need low emission vehicles. Blue skies research lead to the light weight materials we use in our vehicles. [Show material sample.] See £40m Legible London programme which does not have proven benefits. Manifesto is well written. Lots of parallels with the world of arts and culture. Have seen growth in cultural product with funding but need to prove a short-term outcome: this need for impact is the opposite of what innovation is about. Resistance to investing in the long term, eg: many music initiatives vs lack of investment in education. See higher education assessment and impact of research. Inhibits younger researchers. Specialist knowledge: View that this stops you breaking out of the box. But you have to know the rules to break them. [Kids education deprived.] Took years for Picasso to learn to draw like a child. Fetishisation of young people in cultural organisations around their lack of knowledge. Young people end up repeating the same old mistakes. Cultural attitude to risk taking and wariness of positive attitudes to change. See Joseph Wright of Derby or Modernists, who saw the creative use of technology as positive. There is a real public appetite for innovation. See Brunel Tunnel opening: people loved the idea that this was a world first. The Brunels didn’t know the tunnel would be part of an underground railway. Would like artists to see that barriers to science are similar to barriers they face. Michael Porter: Relentlessness leads to discovery. Not the same as Gary Hamel’s ‘let a thousand flowers bloom’ approach, not least as companies may not have the budget for it. ?? : No definition of research, R&D and innovation. See Maran and Haskel QM research. Risk is not synonymous with what we are doing: see See Alwart [sp?]. Eliot: Science not the same as innovation. Alec Jeffries used IT. Public input into innovation. Daniel Ben-Ami: Climate change argument is about kind of response. Norman Lewis: Applied and non-applied research. Can’t elide research and development. Right to separate science and innovation. Danger of commercialising what we do today. Geoff Lawton [check]: Old companies failing creates room for new ones. James Woudhuysen, BIG POTATOES: Not much new creation coming. [To James Wilsdon] Precautionary principle says we should never attempt something unless consequences benign in all situations. No scientific absolutes, see Popper. Falsify-ability. Regulation: Clegg-ish reduction to taxation. Substantive Parliament: people want idea. Be pro-innovation and militant. Workgroups. Kieran Levis, Cortona Consulting: Crisis of innovation? Where is the problem [?]. Paul Reeves, SolidWorks R&D: We are a closed company, as was Jaguar-Landrover. Eliot: Could you do without IP system. Johny Morris, iergo Ltd: Open source software companies. Can’t ignore non-UK research. Problem of small companies not getting innovative when bigger. Guy Rundle [? ], The Age: In Australia lack of vision of the future. Munira: Wider cultural problem. Sarah Farrugia: Where is ethics in this discussion? 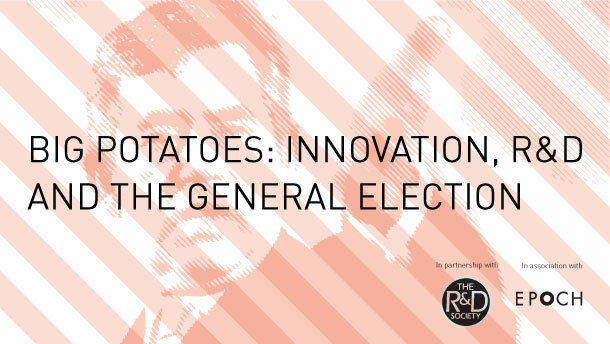 Martyn Perks, BIG POTATOES: Culture of limits that leads innovation [check]. See who attended via the event on the booking page. To book, select the quantity of tickets required from Ticket Information (below) and click Order Now, at which point you will be taken to the Eventbrite booking page to enter your details and payment information. If you have any problems booking please email us. Note: You do not need to create an Eventbrite account to book. Payments are made via the PayPal and Google Checkout accounts for Nico Macdonald at Spy and will be recorded as such in the record of your transaction.